Six-year-old Sam is a bright, energetic boy. His mother brought him in for therapy one year after his father died. He has become more and more oppositional, leaving the family on edge about when he will have his next tantrum. His teachers find that he drifts off in class and can become aggressive with other children. His mother finds it difficult to care for him as well as find her own space to grieve. She feels guilt about not having enough energy to deal with his everyday demands. She found that he was unable to work with a therapist before but he enjoys art. A school social worker talked to her about art therapy. 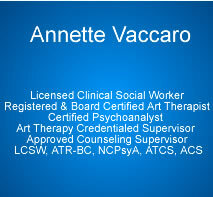 Annette Vaccaro is a board certified (BC) and registered (A.T.R.) art therapist with the art therapy credentials board. She is a faculty member at Caldwell College and lecturer at Montclair State University.